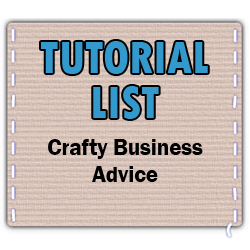 Here is what should be a completely thorough list of the tutorials that are available in the Crafty Business Advie boards. Generally, each board would have its own list, but since there are so few in this category they will, for now at least, all live together. Some tutorials may have been excluded for lack of clarity and no tutorials listed solely on other sites were included. This first one I made is a bit sloppy,not the best pics, but it came out very nice and did a great job holding brooches on my craft table. Stretch velvet from a Goodwill dress, a tray, fabric to roll up, and glue.